The night at the flea bag hotel was awful. I don’t usually leave bad reviews but I did this time. Apparently I was not the only one as I read one that said the place was infested with bed bugs. Yuck! One of the defining movies of my childhood was National Lampoon’s Vacation staring Chevy Chase. It was our family, except my brother Ryan would have to play Audrey. As I said yesterday we traveled far and wide in our own version of the Family Truckster up and down the east coast making it as far south as Disney World and as far north as Philadelphia. Here we were re-living my past and waxing nostalgic on our own version of Vacation. This time however we would leave our own kids at home and travel on our own grand adventure in a go-cart sized car. Today, Sunday, we hit the road and couldn’t get out of Newport News fast enough. We wanted to grab a quick breakfast and saw a 7-11. I dang near flipped the go-cart over as I over corrected trying to make it into the parking lot. As I did that two cops were walking out of the mini-mart with their coffee and doughnuts. I am not making this up, and paid us no mind. We were the first ones to arrive at Busch Gardens, just like Chevy at Wally World. We would wait more than an hour behind traffic cones for the park to open while I was secretly hoping that we wouldn’t come across John Candy telling us, sorry folks, park’s closed. This part of our trip is what we were looking forward to. Remember the theme of our trip is Roller Coasters, Family, Monuments and Beaches. Well this was day one of our roller coaster tour and it would not disappoint. We parked near the entrance of the park. There would not be any Chariots of Fire or running in slow motion today. We paid our hundred bucks and decided to sign up for the fast lane which cost and extra Benjamin. It is sort of like the VIP treatment sans the paparazzi. It allows you to cut in line at most of the rides and not have to wait up to an hour for the very popular coasters. Busch Gardens is another place that defined my childhood. I was here for the first time since about 1985. The park is set up as if you are in the Old Country of Europe. Each country has its own flair, food, crafts and stores. As you travel through each country it feels like you are there. They have music playing as if you were in that country and places like the big dinning hall in Germany feels like you stepped into Octoberfest. Each country also has their own thrill rides. The Loch Ness Monster is in Scotland and the Tempesto is in Italy. We arrived in England at the entrance of the park and had to wait behind a rope until 10 am when the rest of the park opened. We met a mother and daughter that are season pass holders and they told us what rides to make sure we had on our list that day. 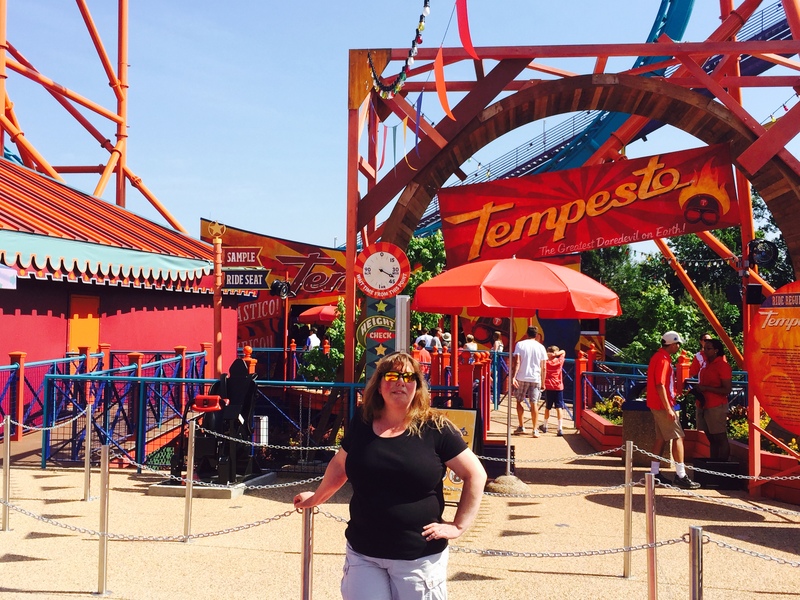 She told us that the Tempesto is the one that everyone wants to ride and to make sure we rode it first. The Tempesto and the Loch Ness Monster are two rides that were not part of the fast lane pass so we would have to run to get their first. 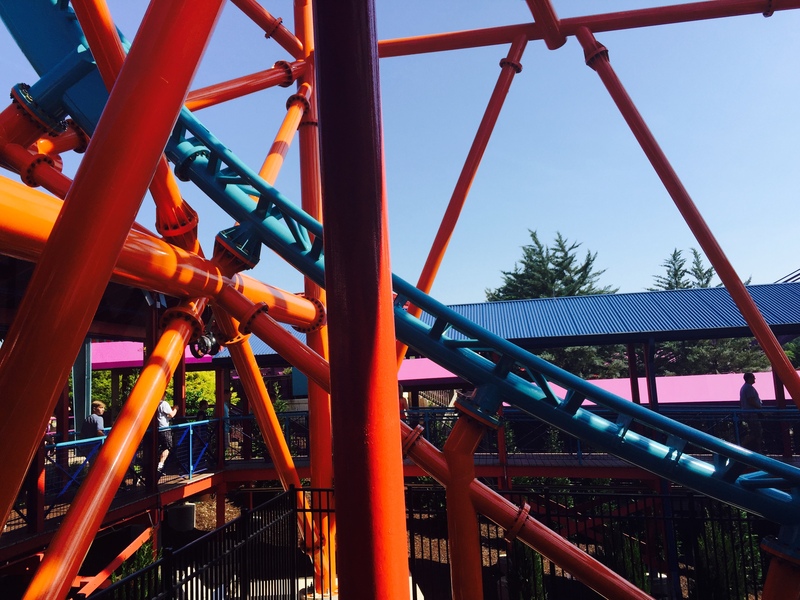 Get ready rabid readers because the rest of this post is all about the coasters and what we thought of them. At Busch Gardens they would have some of the most amazing roller coasters I have ever been on. 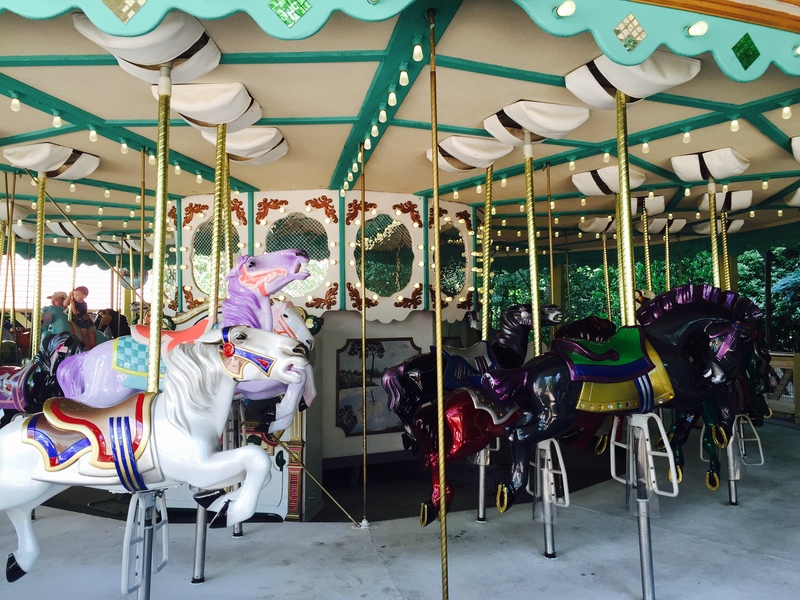 We will describe our experiences on each ride and provide a few fun facts about the ride from the park’s website. We had to run through England, the Far East and Greece as we made our way to Italy to ride Tempesto. We ran as fast as we could, me holding Michele’s hand along with 1,000 other people making their way to the newest roller coaster in the park. We arrived and were one of the first people in line with just a few minutes to wait. In the rich tradition of the classic Italian daredevils, no single man wowed the crowds like Tempesto. Busch Gardens’ daring new roller coaster, Tempesto, lets riders take center stage and recreate his signature stunt. Guests daring enough to take on Tempesto will race into unbelievably tight turns at 63 miles per hour and defy gravity as they roll through a complete inversion 154 feet in the air. Busch Gardens newest thrill coaster features three launch experiences and Tempesto’s signature loop-the-loop. The same hills and thrills that made the people cheer “Tempesto!” are waiting for guests at Busch Gardens. Robert: This coaster is absolutely amazing. I have never been on anything like it and what a way to start our roller coaster tour. It had been more than a decade since I have been on a roller coaster and this one was one that made me feel like a kid again. The ride started off going forward as it shoots you down the track then it hurls you backwards up almost to an inversion. The cars then shoot you forward again the next minute and a half is mind numbing awesomeness. I could hardly catch my breath at the end of the ride and I said to myself, holy crap what a ride, I have no idea what I have just gotten myself into. Michele: Tempesto! Lives up to its description. I hadn’t been on roller coasters since Six Flags lost its franchise option at Elitch Gardens in Denver, Colorado around 2003! 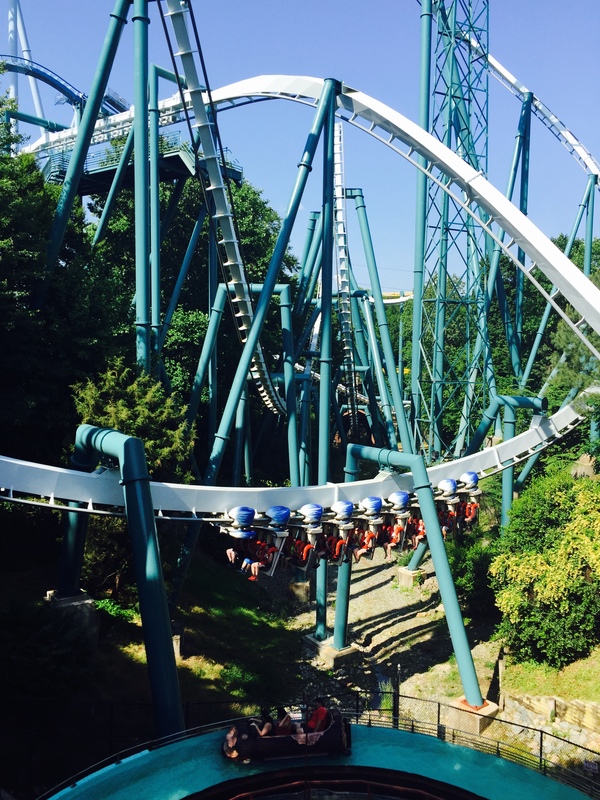 They had thrilling rides but Tempesto is not your fathers roller coaster. As Robert mentioned it shoots you forward just to pull you back to shoot you forward again basically like going from 0 to 63 mph in the blink of an eye! And that was pretty much it for me, I blinked and my eyes refused to open back up! Get ready to climb aboard Verbolten, our multi-launch, indoor/outdoor roller coaster. A German tourist center serves as the ride entrance and as the launching point for an autobahn touring experience. An unexpected detour launches riders into the verboten Black Forest. A lightning fast, multi-sensory dash through the dark and foreboding woods ends with a terrifying 88-foot plunge toward the Rhine River that will leave everyone breathless. Luckily, this exhilarating ride leads right back to the fun and the festivities of Oktoberfest. Michele: Um……..F*$@&!!!! Yes, I said it, very loudly in the pitch dark total silence. It was my first opportunity to breathe after the launch. I was struggling to see the light at the end of the tunnel, oh yeah there wasn’t an end there was no light only red glaring wolf eyes and howls. Then as I began to take in my breath from saying the word you never say in public, when all of a sudden it felt like we were falling straight down. In fact we were falling!! I have no idea how far we fell but the track detached with our car on it and slammed onto the next level. After that I have absolutely no recollection except for exiting this ride. I must’ve blacked out, god knows my freaking eyes were closed again and I had a crazy stupid look on my face in the pictures! Dang it. Beneath the thick mist of an old Scottish Loch, an ancient sea creature swam undisturbed for generations. More than 30 years ago, this creature was awakened — right here at Busch Gardens. 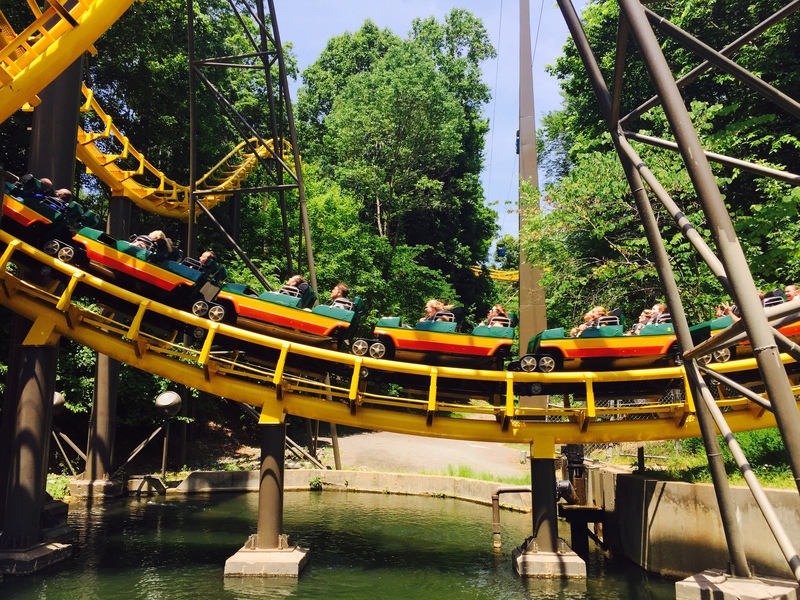 Now a classic, it’s easy to see why Loch Ness Monster is still one of the most popular rides in our park’s history. This interlocking, double-looping coaster stretches a monstrous 13 stories tall before racing those who challenge it down a 114-foot drop, with speeds as fast as 60 miles per hour. Robert: This ride is still one of my favorites. It was the biggest, fastest coaster I rode as a kid and it still does not disappoint. It is an old school flipper coaster with two inversions in its iconic yellow with green cars and is still quite fast. It brings you close to the lake and through a windy tunnel. When we tried to ride it earlier in the day it was closed and the park staff didn’t know if it would open. We tried one last time as we worked our way over to France to the Griffon and it was open! Even after almost 30 years, the search for the great Loch Ness Monster still holds a place in my heart and was a highlight of the coaster tour! Michele: Exhilarating ride! Brought back memories of rides I rode at Six Flags Great America as a teenager. 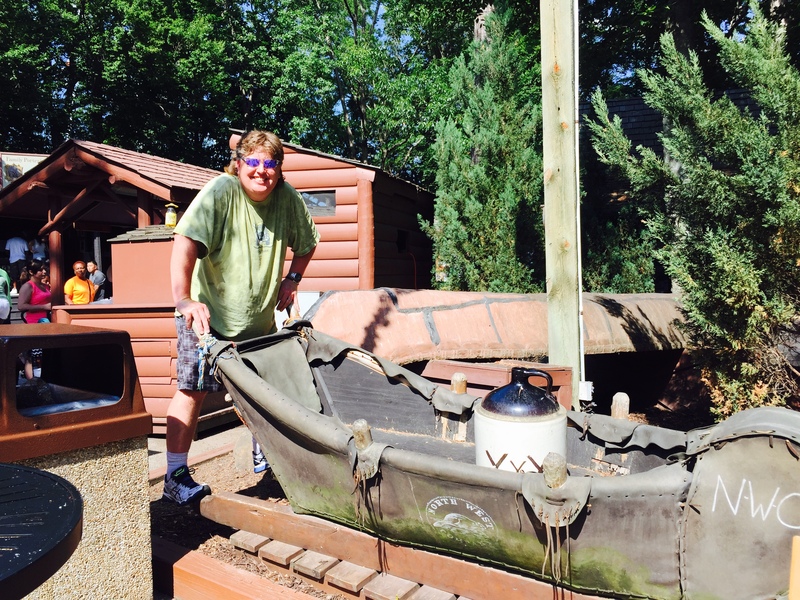 It was great hearing Robert’s stories about this ride. For me, I didn’t remember hitting my head quite as much as a teenager. Could be this Mom shape is getting the best of me on these rides made for the kiddies! Born of myth and imagination, Apollo’s Chariot soared high up on the list of favorite coasters when it debuted–and hasn’t come down since. While it’s consistently ranked as one of the top 10 steel coasters in the world, few rides come close to the experience waiting for you here. Like the Olympian sun god, Apollo’s Chariot races toward daring heights, only to dazzle riders on the way back down with one of the smoothest, fastest trails ever blazed. 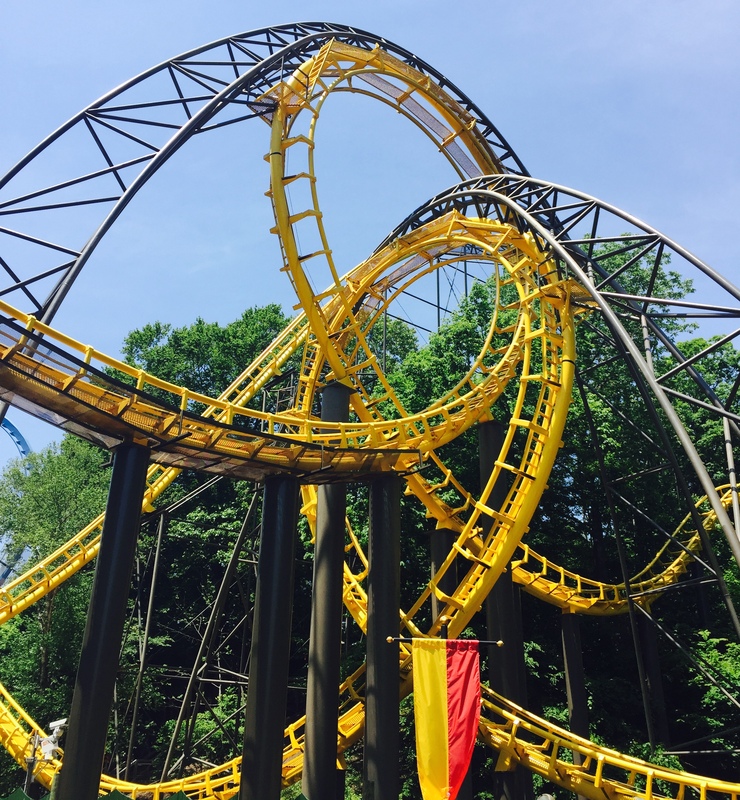 From mind-bending climbs to the weightless wonder of floating airtime, you’ll see what has kept coaster enthusiasts coming back for more year after year–and why Apollo’s Chariot reigns as one of the mightiest coasters of all time. 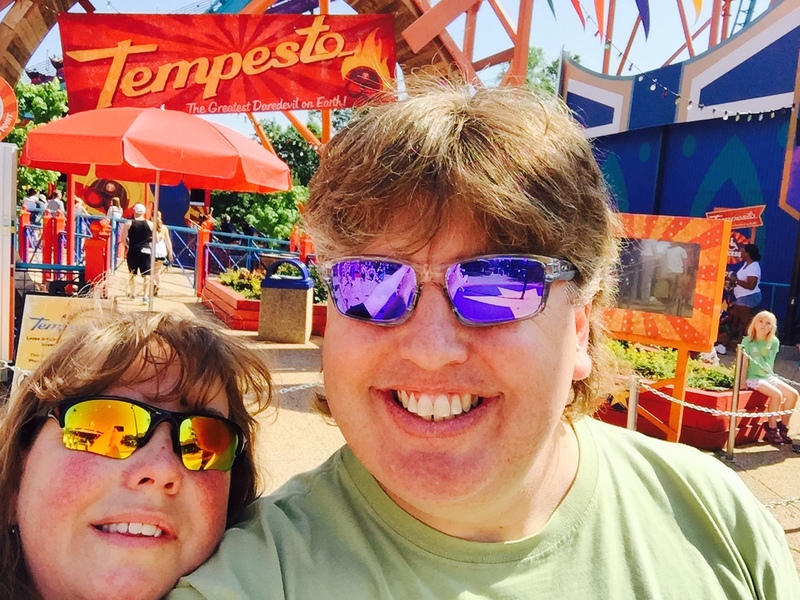 Robert: This ride was quick and fun! We almost overlooked it as we headed from Tempesto to Verbolten. It did not disappoint. It had just the amount of speed and flips to keep you guessing along the track. It’s old school and I am glad we got to take a ride. Michele: Love this coaster! Level 4 instead of Level 5! Non-concussion style seats and restraints made for that smooth ride in the description of above. But alas the pictures speak for themselves……again my eyes are closed and I have some weird grin on my face, no we didn’t pay 20 bucks for the picture! Join the bravest of ride warriors and challenge yourself to the 205-foot, 90-degree, 75 mph free fall. Some say that just waiting your turn to ride Griffon is a heart-pounding experience in itself, as you anticipate the moment of that cliffhanger drop on this tour de force roller coaster by B&M. Spectators get in on the fun, too, with thrilling vantage points and one serious soak zone kids love. Robert: This by far was the most fun of the coasters of the day. All day as we wandered through the countries we kept seeing this large blue and white coaster that was the tallest in the park. It has something that I have never experienced on a coaster. As you reach the top it holds you in the air for about three seconds and then the brakes let go. It feels just like that feeling you get in free fall before your chute is pulled on a static line sky dive. It is amazing! 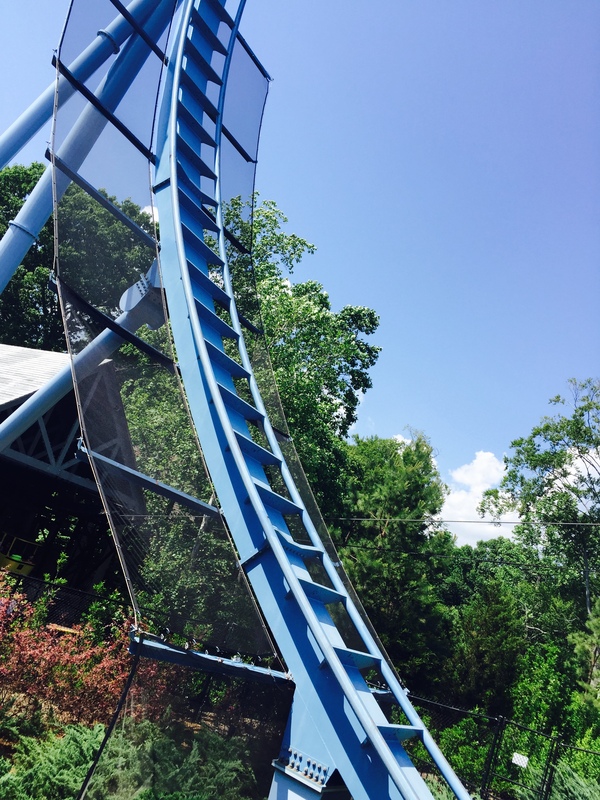 The coaster has plenty of flips and turns and just enough speed to take your breath away. Michele: I totally love coasters where you sit on the seat and your feet dangle! I’m short, why doesn’t this make sense! Oh because the restraints that come down over your head are so huge your forced to only keep your head in an upright forward position. This ride is mind-numbing fast! From the first click I began counting. This means only one thing, I am scared out of my MIND! Seriously! The guy next to me at first thought I was counting like a count down – Hooray! Absolutely not! I counted to keep from passing out. We get to that place on the Griffon where it hangs you there, you do feel like you are caught in the raptors claws, thats at 36 seconds in. 36, 37, 38, 39……..lost count! Made up the lost seconds by guessing 43, 44, I stopped after Robert touched my hand at the end and said it’s over you survived. I was still counting!!! Its 120 seconds from start to leaping off of the seat! German villagers have long told stories about a legendary snow beast they call Alpengeist, the Ghost of the Alps. Like any good ghost story, it’s what you don’t see coming that scares you the most. Meet Alpengeist. One of the tallest, fastest, most insane coasters in the world. Before you can say “boo,” the floor drops beneath your feet. The surprises have begun. What comes next is what many coaster enthusiasts still call the ride of a lifetime. After climbing to an Alpine high 195 feet, riders are hurtled through six staggering inversions at speeds up to 67 miles per hour. 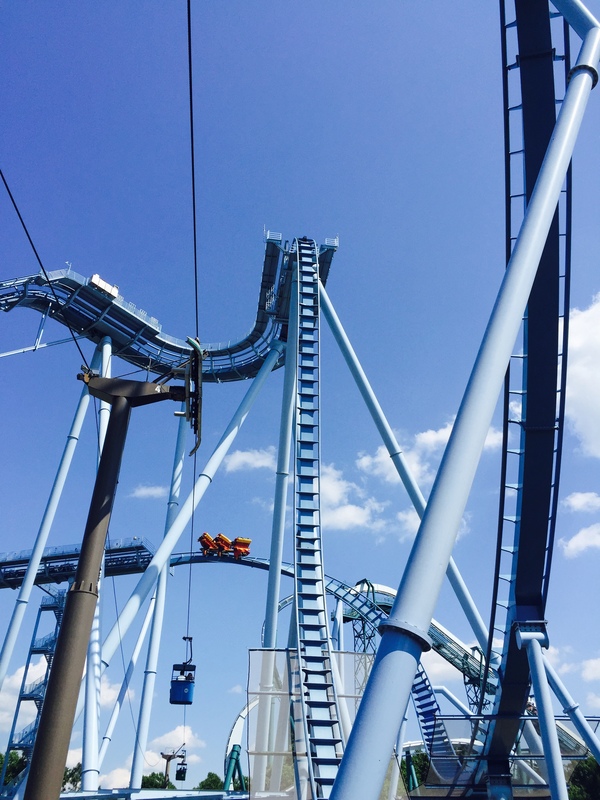 Consistently voted one of the top 10 steel coasters in the world, it’s the spirit of the Alpengeist that will haunt you long after you are finally released from its power. Robert: This ride was very cool. It was the last coaster we rode at Busch Gardens. It was part of the fast lane pack so we jumped on right away. It it is one of those coasters with the track above your head and you sort of swing through the air. The coaster had just the right amount of speed, inversions and corkscrews. It is designed to feel like you are on a ski trip through the alps and it did not disappoint. 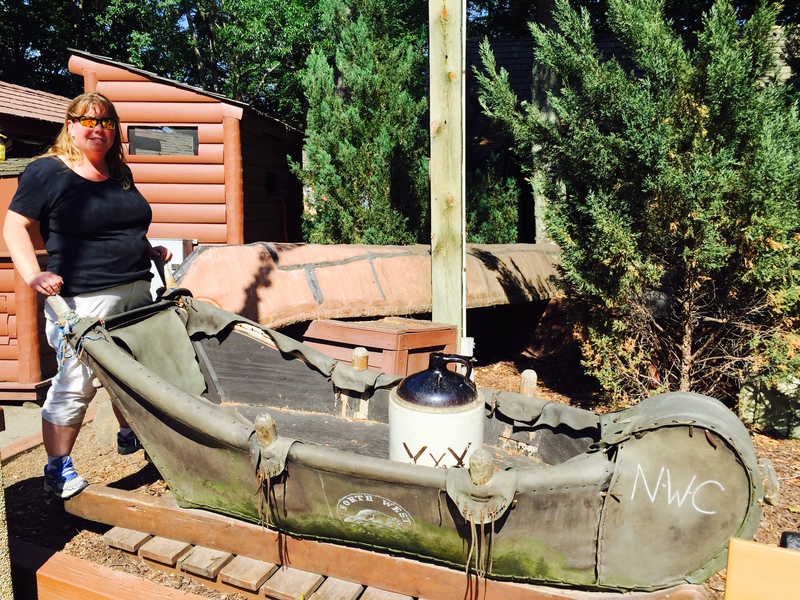 Michele: Loved this ride! Again, my feet are dangling, it works great for us shorties. 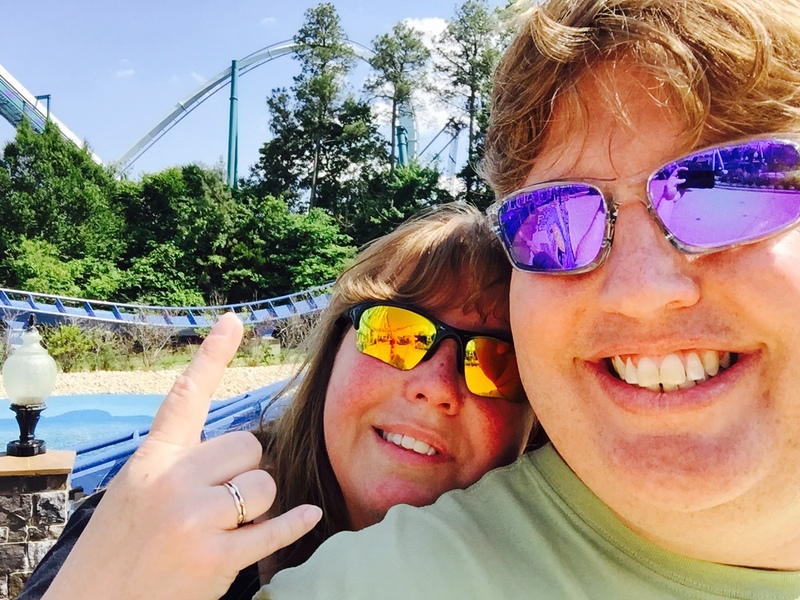 This ride did not disappoint and brought back great memories of riding my first floorless coaster with my sister-in-law Julie at Six Flags Elitch Gardens in Denver, Colorado. We tried to steer clear of the water rides because we didn’t want to get wet on our run through the park. Escape from Pompeii was recommended by our friends at the England gate and it did not disappoint. 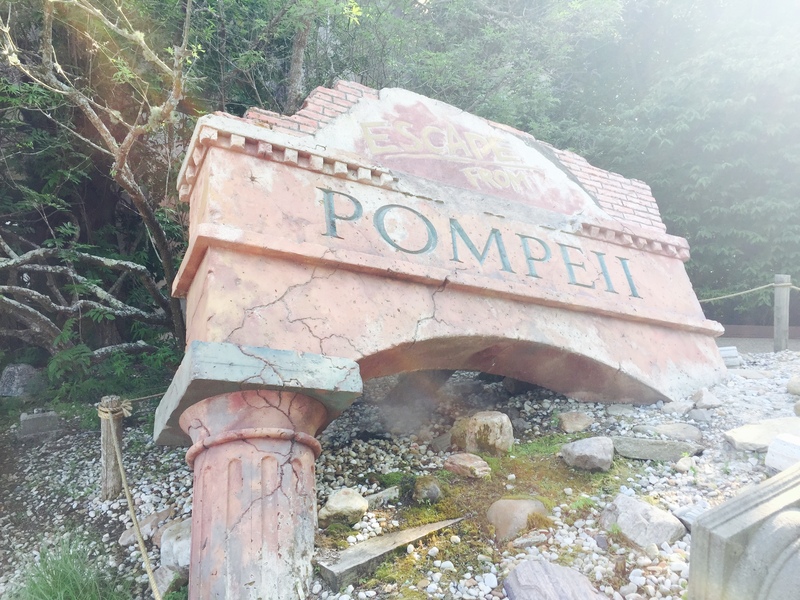 A journey through the ancient ruins of Pompeii turns out to be more adventure than visitors had bargained for. Even the mighty Roman Empire had been no match for Mt. Vesuvius, which draped Pompeii with a blanket of lava and ash, erasing it from the map for nearly 1,700 years. But don’t worry, this angry volcano has long been at rest. Hold on tight as a leisurely boat ride through the ruins of this great city suddenly turns explosive. One rumble from the mighty mountain and the race to escape from Pompeii is on. Robert: I love water rides. From the outside though this looks like just a quick up and down and a splash at the end. But its not. Once you reach the top, your boat floats through what looks like the city of Pompeii with large, marble-like monuments falling in front of your boat and lots of fire above and around you. As you splash down after a steep plunge you are left with a smile on your face. Michele: I must say this ride tricked Robert. The whole way up to the top he keeps saying my shoes are wet and this is going nowhere! Then literally, WHOA! comes from his lips as a huge ball of propane fueled fire narrowly misses his face and travels along the ceiling of the building! I’m laughing of course! We then watch a statute fall above us and quickly our boat heads for safety, or so you think. The big splash at the bottom WILL get you wet! As my rabid readers already know, I love horror movies and monsters. Each October we watch 31 Nights of Horror and I love all of the classic Universal movies. Curse of DarKastle was right up our alley. This was a ride that was suggested by our friends we met at the gate in England. Deep in the snow covered hills of Bavaria stands a foreboding castle frozen under the spell of a centuries-old curse. The castle has been uninhabited for decades. By the living, that is. Literally frozen in time, these ancient castle walls ache to reveal the secrets they have held. To whisper a warning. To tell you, urge you, beg you to leave. Except it’s too late. What begins as an enchanted sleigh ride ends in a bone-chilling chase packed with dizzying drops, surprise twists, and such sensational 3-D visuals, you won’t believe your eyes. Robert: This was a fun ride. It is an indoor coaster-type ride that incorporates a 3-D movie and story of a werewolf tale. I really enjoyed it but, as I said I love monster stories especially the old, black and white ones. Michele: We entered DarKastle to get out of the southern heat. Our friends had told us that this was one of the few air-conditioned places to go. Great! We walked in with our Fast Lane passes and into what I thought would be a haunted house, walk-through type adventure. NOPE! Immediately all you can hear is loud slamming doors. I can’t see yet what that is. As we venture closer and deeper inside what appears to be a cave. Then I glance to my right, never in all my years going to amusement park have I seen one of these! A vomit station! What?! I took a picture of it and sent it to Nicole and said what am I doing here?! Then the crowd opened up with another slam and I could see what was being slammed! The rides cars looked like coffins! WHAT THE HELL! I said to Robert. Those look completely closed in. Well the tops were actually open and part of the front but from my vantage point I couldn’t see that at first. Slam! Slam! It was bone shattering and made me jump literally every time they did it. I told Robert remember that sign about heart conditions, I am on blood pressure medication, I think I’ll go stand by the vomit station. Oh no, we’re next! Dang it! In I go. The ride itself wasn’t extraordinary it kinda bumps and floats and spins you in circles playing the motion sickness thrill, which is the reason for the vomit station and why I didn’t really enjoy the ride. The 3-D animation was decent but the story was difficult to follow. In the beginning before the doors are slammed shut if they’d give you a prologue it would have made more sense. 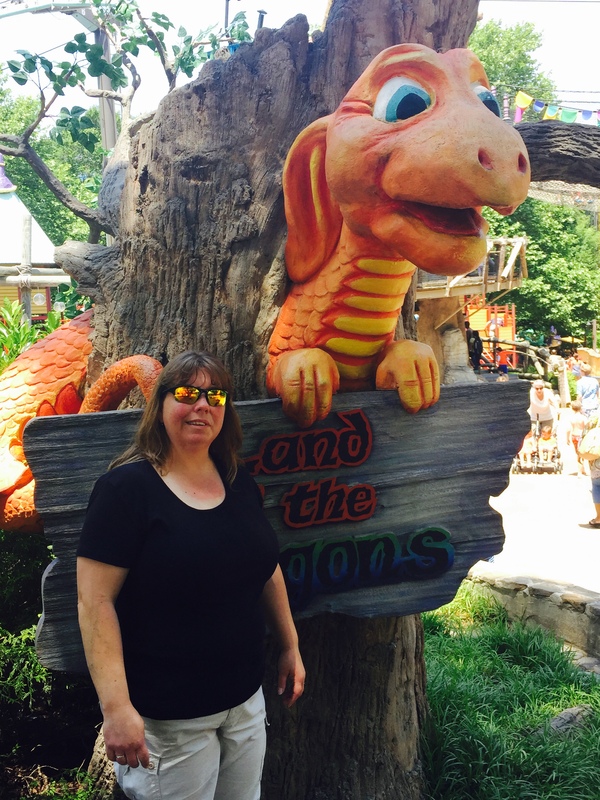 Our Busch Gardens experience was stupefying. Along with the rides and the adrenaline rush of the coasters we spent almost an hour in the huge dining hall in Germany and watched a show during lunch. We grubbed on mac and cheese in New France that was part of a food festival in the park, looked in all the shops and almost bought an Irish wool cap, a Nutcracker and a coo-koo clock, and ended the day with a bit of gelato in Italy. 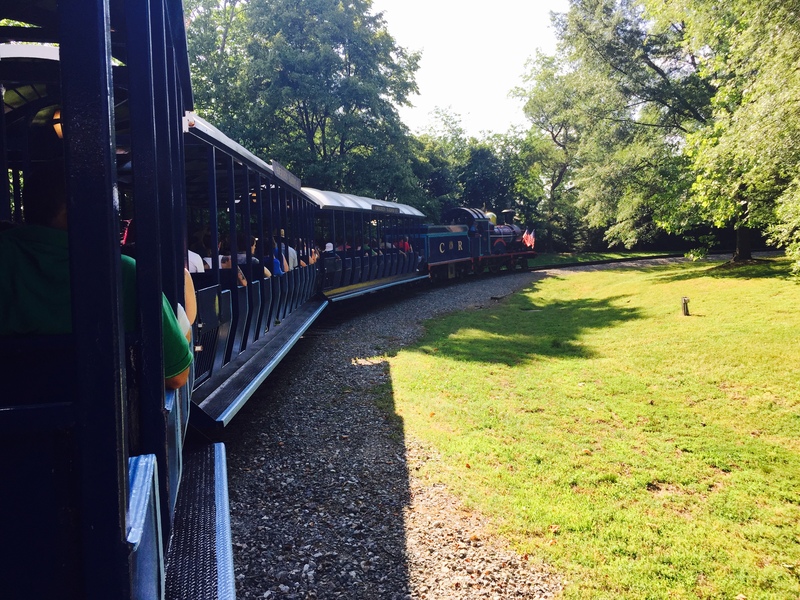 We were out of the park and on the road northwest toward Kings Dominion. We found a room on Priceline near the park and relaxed for the evening.